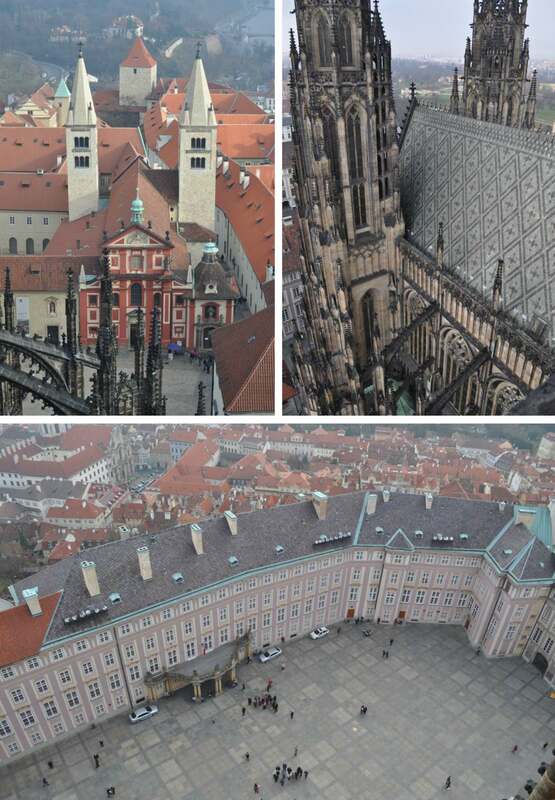 With Prague becoming really popular place, it is getting more and more difficult to visit the most famous places and really enjoy it, not to get hurt by someone else selfie stick and have the place for yourself. 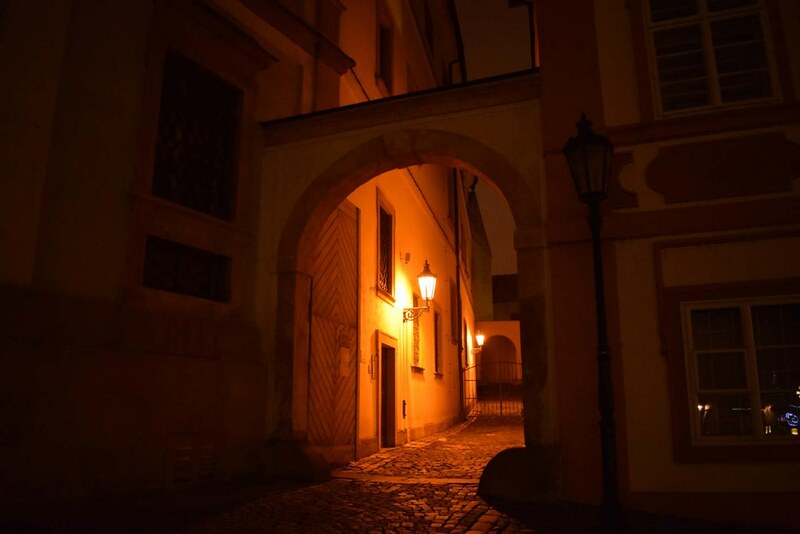 Therefore the best times to visit are early in the morning or later at the evening. 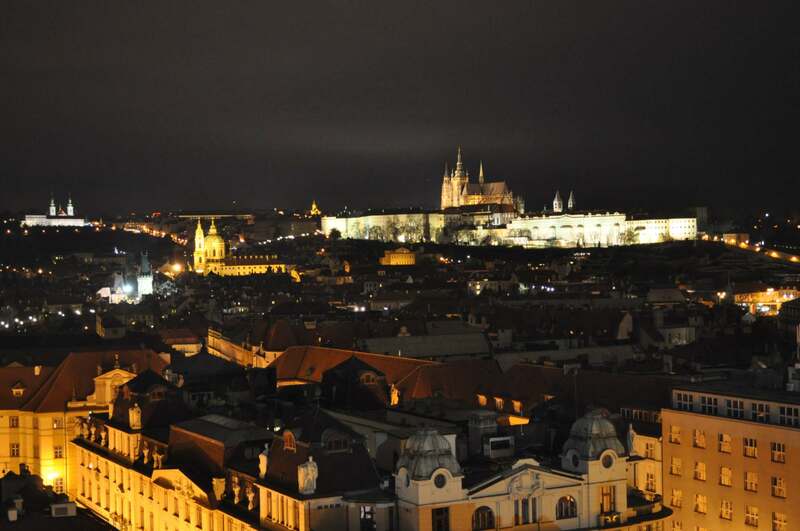 You can find pictures how Prague Castle (and around) looks like after dark. 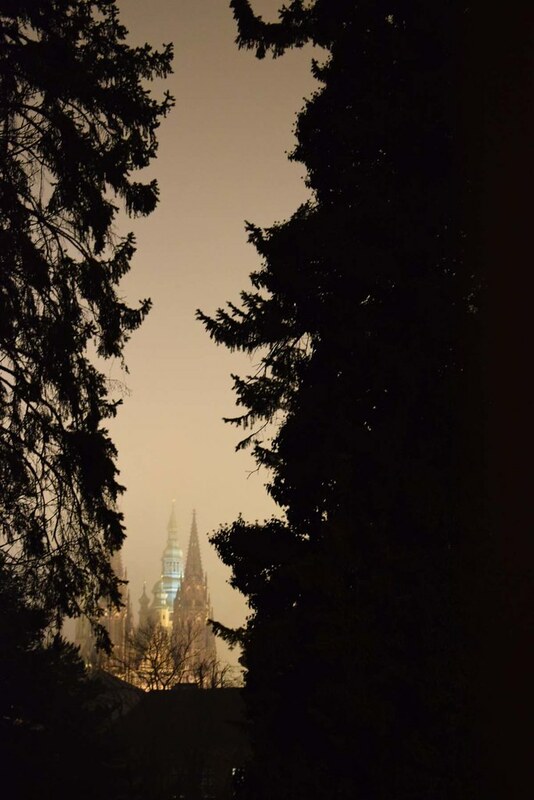 We are getting closer to the Castle. The main entrance, which serves as an exit only now. 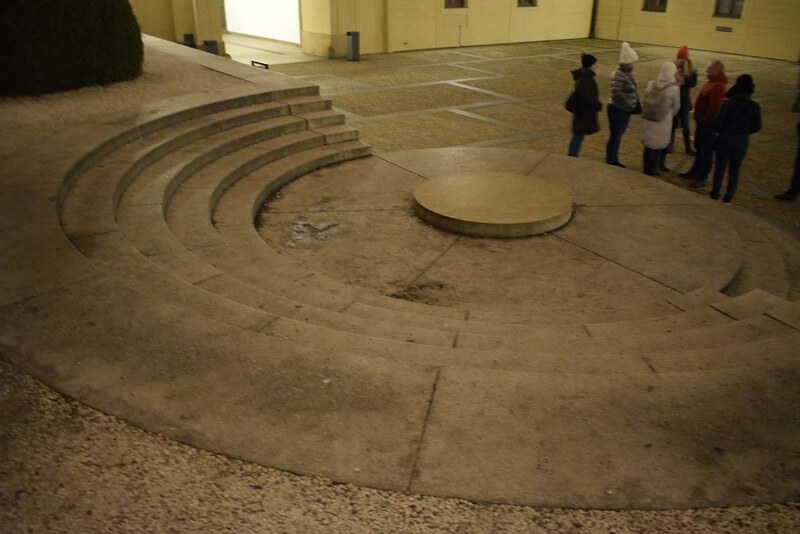 I simple love these Plecnik’s round stairs, I had to make picture even at night. 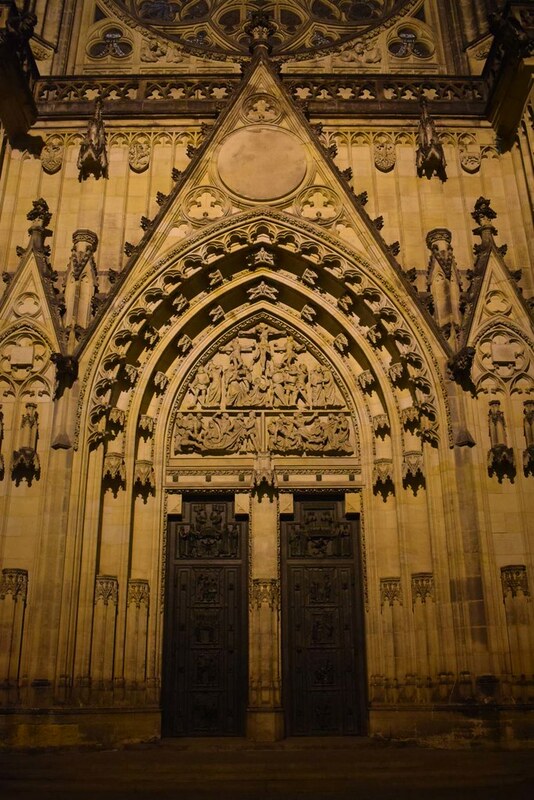 Already in, entrance to the St Vitus cathedral. 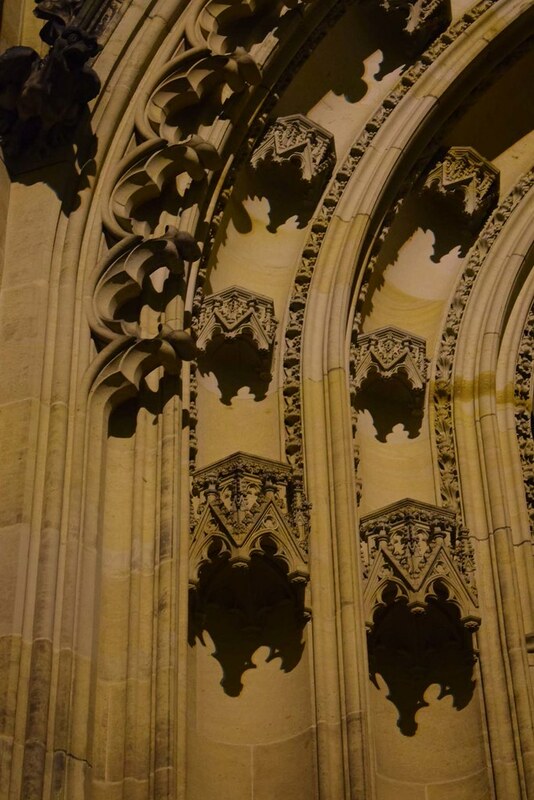 Cathedral entrance detail, yes, the empty spots were never occupied by statues, did we run out of money? … and again, from back now. Private bridge from the Royal palace to the Cathedral. 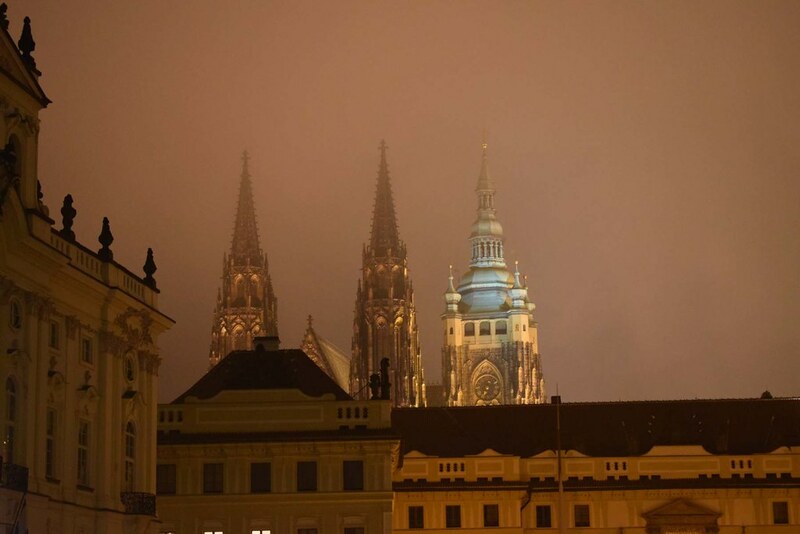 Look at the beauty, from Castle to Little Town with St Nicholas Church dominant. 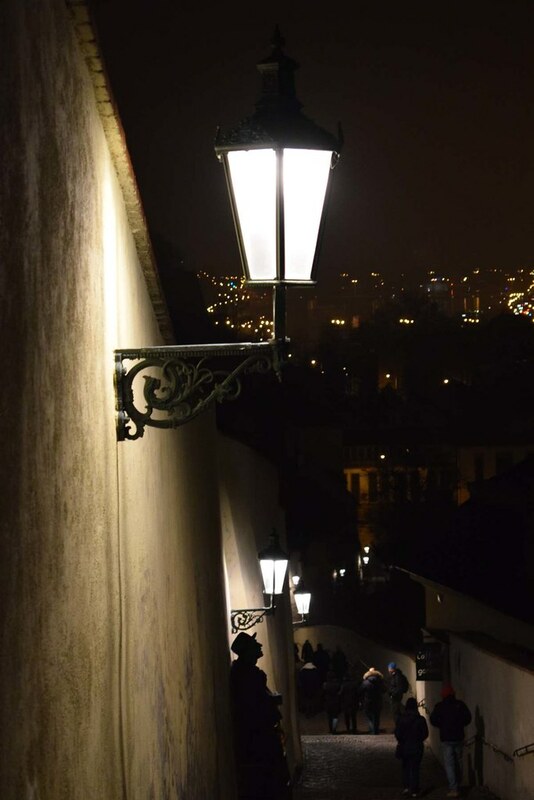 The Old Castle Stairs (Stare zamecke schody) back to the city. 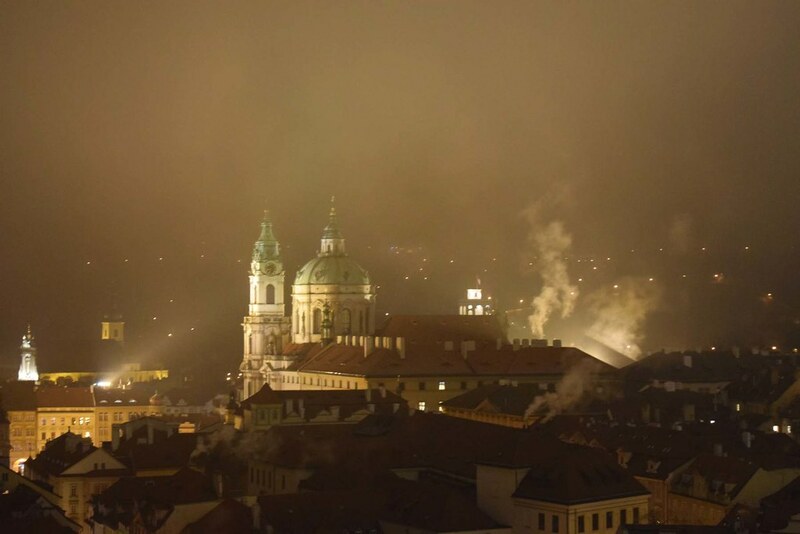 This winter I was walking around my city of Prague and I made a lot of shots with different topics. 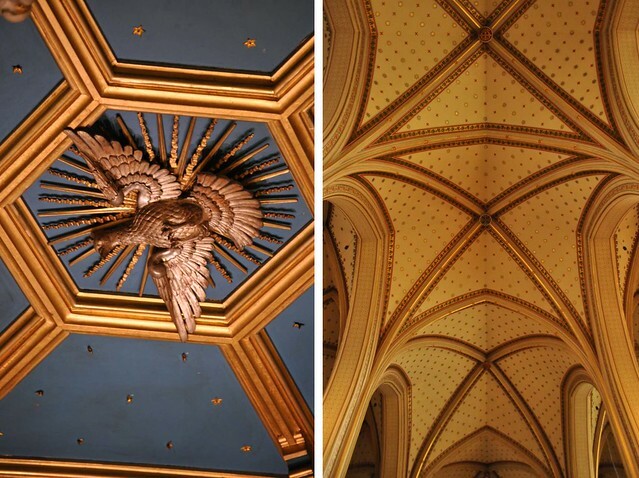 Thus for Weekly Photo Challenge: Lost in the Details I have nice shots from Prague Castle. 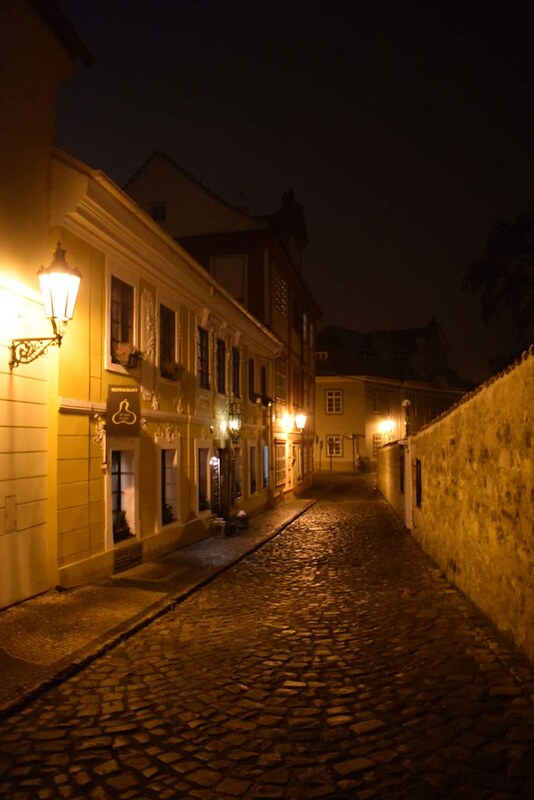 The first gallery are details from the Golden Lane, a small pictoresque street at Prague Castle premises with cute shops and small museums. To enter the street you have to pay admission fees, but in case you come before or after the opening hours, the place is for free and almost deserted (of course the small shops are closed as well :-)). 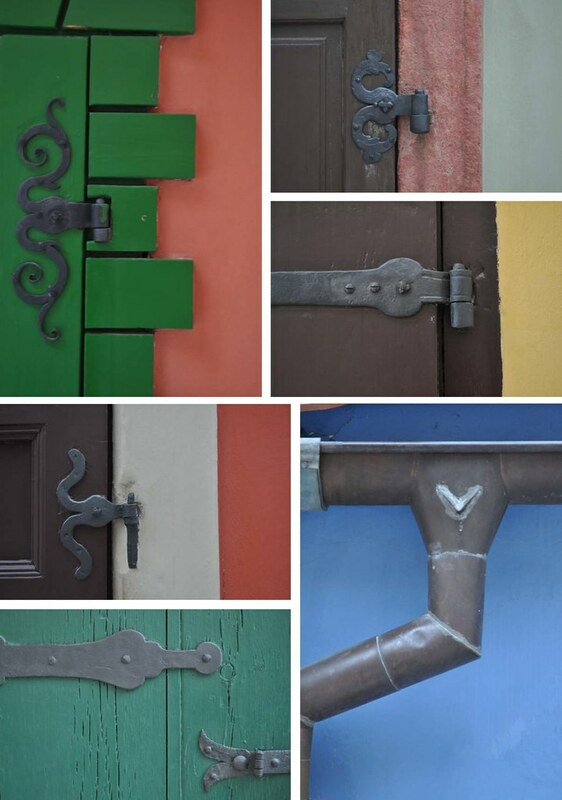 For the next gallery we stay at Prague castle, enjoy the details from the side door to St. Vitus cathedral. 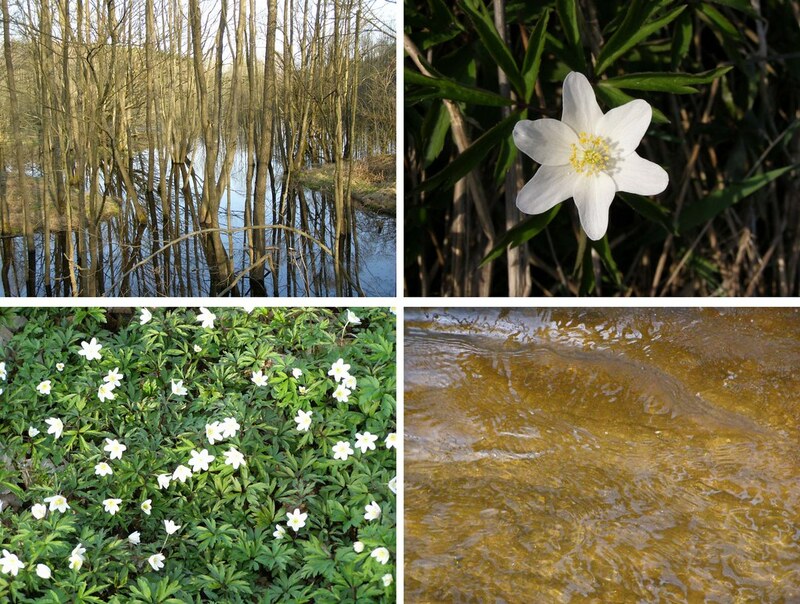 Spring is coming and the weather invites us to go out, the last gallery is from Western Bohemia. 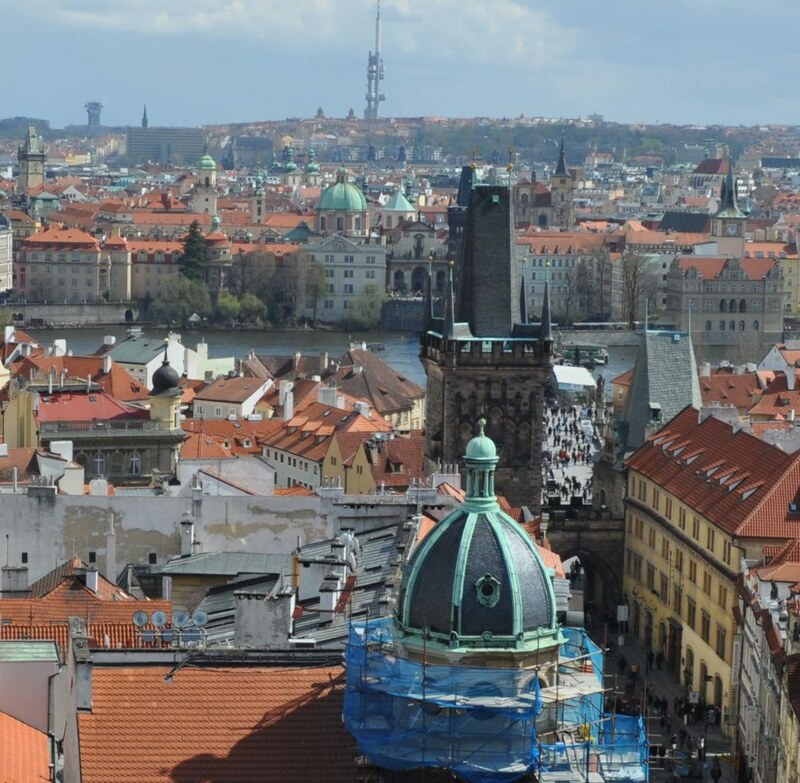 Our last tower on the left bank of the Vltava River is the Bridge Tower in Little Quarter. 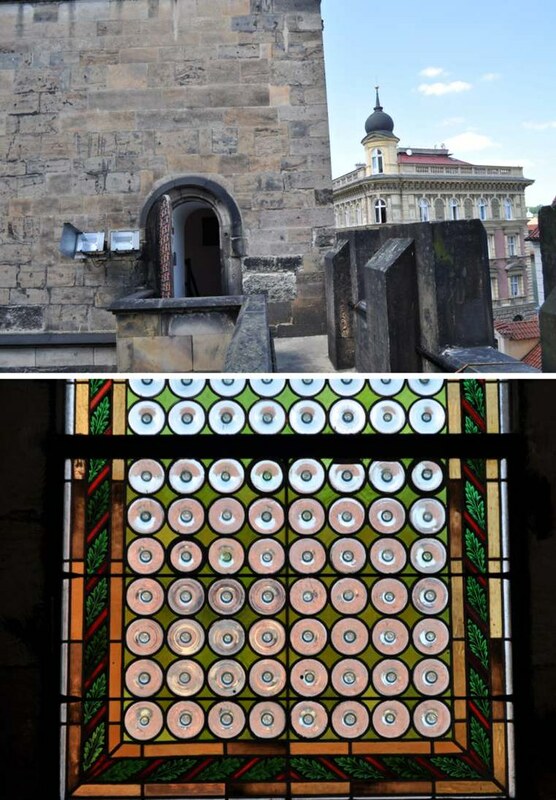 There are two of them, smaller and older one, you can read about it at Prague Towers (1) and the higher one for today’s post. Originally at this place another small romanesque tower stood there to be in pair with the existing one belonging to romanesque Judith’s bridge, which fall down in 14th century. 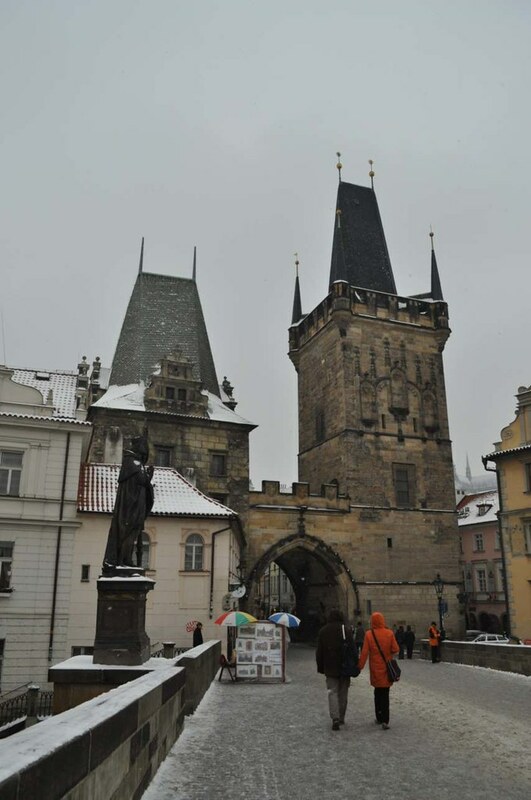 After Charles bridge was built (1357 – 1407) a new gothic tower started to be built at this place, it was finished after 1464. The tower was built as a copy of the Old Town Tower Bridge (our next post), but less decorative, less symbolic. 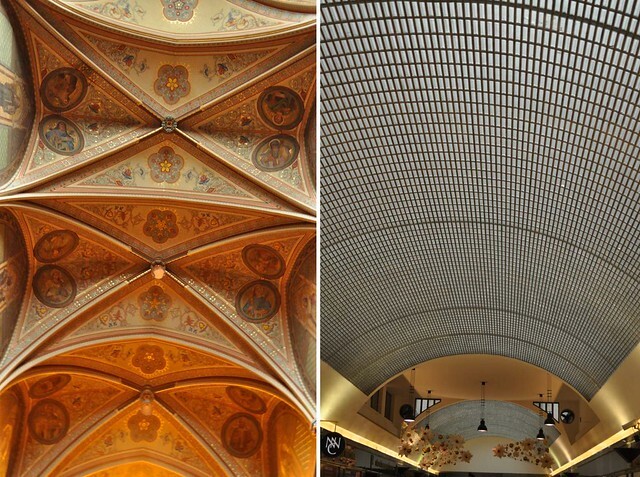 The last reconstruction was done in 1879-83 by architect Josef Mocker. 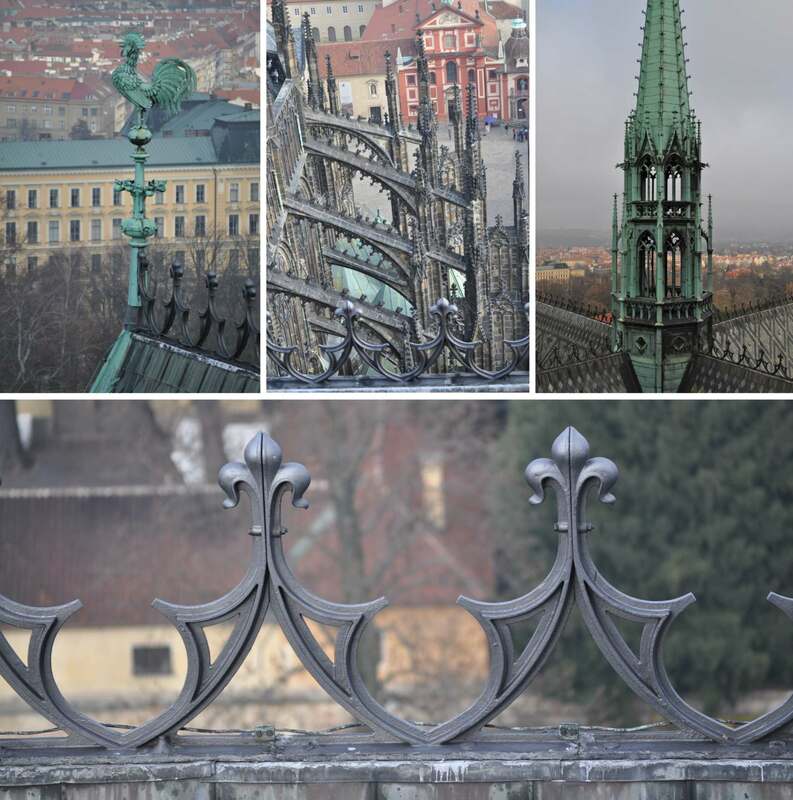 Both towers are connected by the gothic gate with a spirelet decorated with the following coats of arms: Empire’s Eagl, Czech Lion and the sign of Upper Lusatia, bellow are the symbols of the Old Town and the Little Quarter. 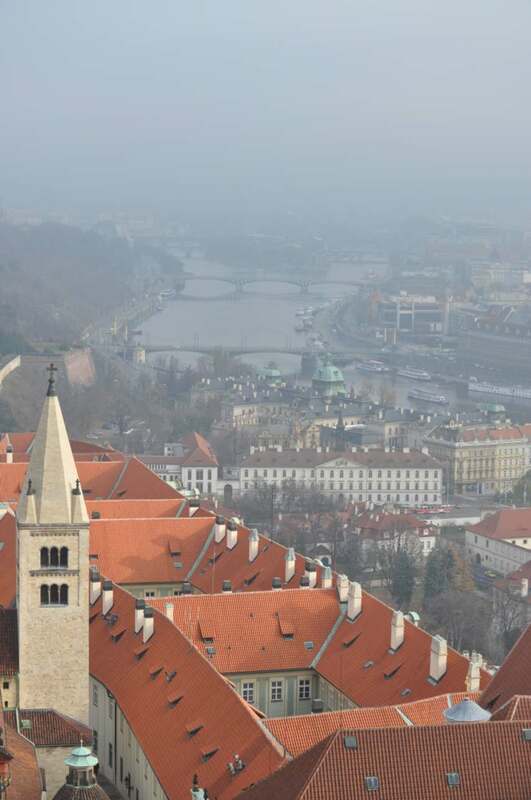 Bridge towers were often used as a display and warning, therefore in 1517 there was shown the head of robber knight Jindřich from Bohnice, who was executed. But now you won’t find it there :-). 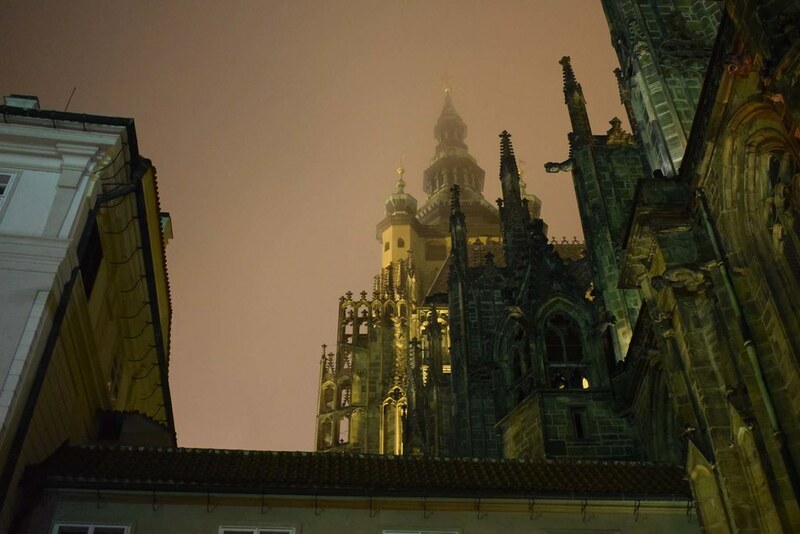 The height of the tower is 143 ft (43.5 m) and you have to climb 146 stairs to reach the view. 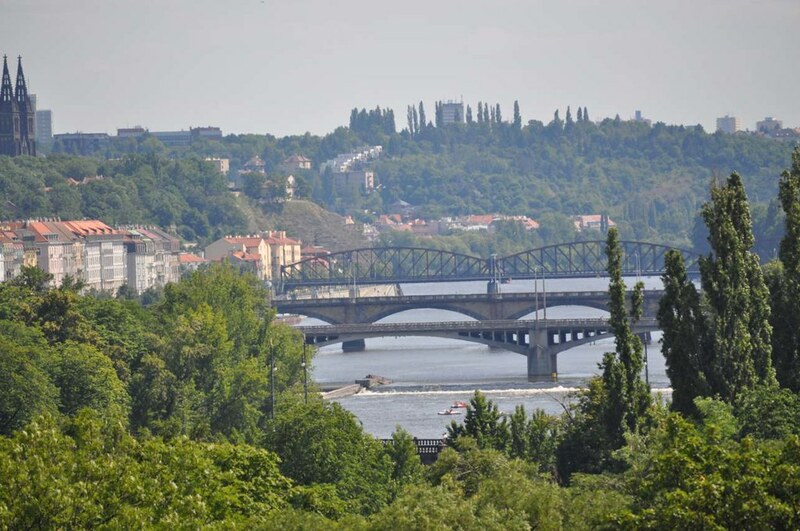 After the visit to the Bridge Towers I recommend you to visit Café Kafíčko, cafe with the best coffee in Prague, nearby in Míšeňská 10 street. 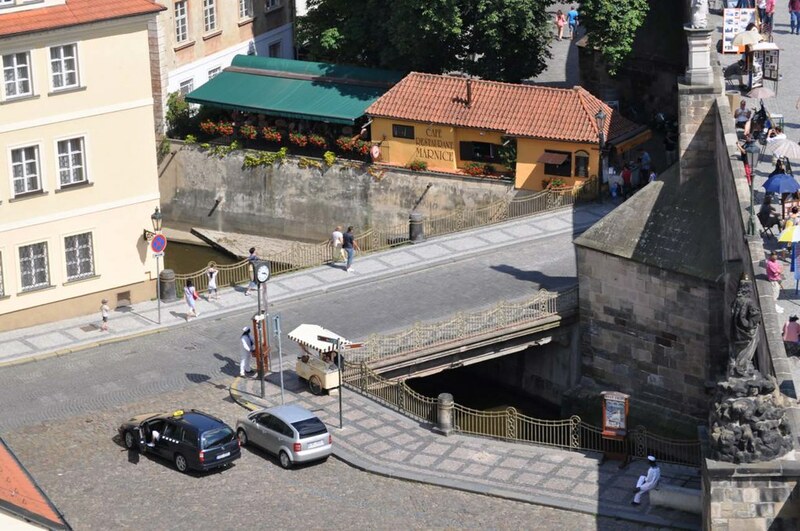 Looking down from the tower you see the small square and Čertovka Channel with a small bridge. But you won’t go there. 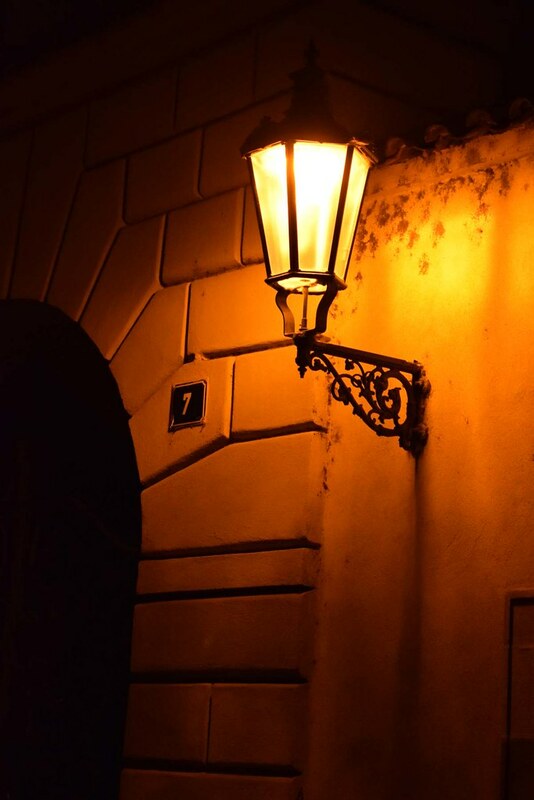 You should go to the left, there is another small square with green gas lamp-post (kandelábr) and looking at the building on the next shot you go right to Míšeňská street to the cafe. 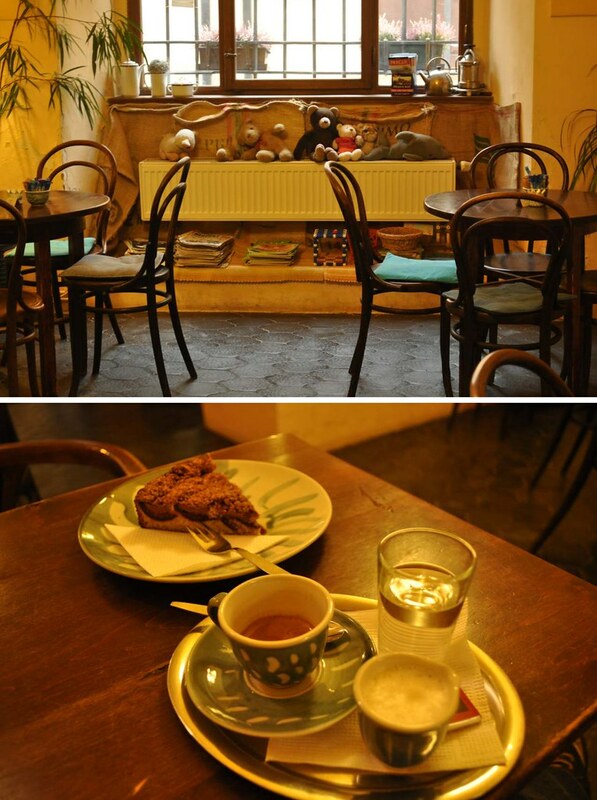 The interior is cozy and the coffe is indeed the best in Prague, you can also try some nice sweets there. When you are there, take a look at the people in the cafe, you might find me :-). The next tower is Old Town’s Bridge Tower, here as seen from the Little Quarter Bridge Tower. 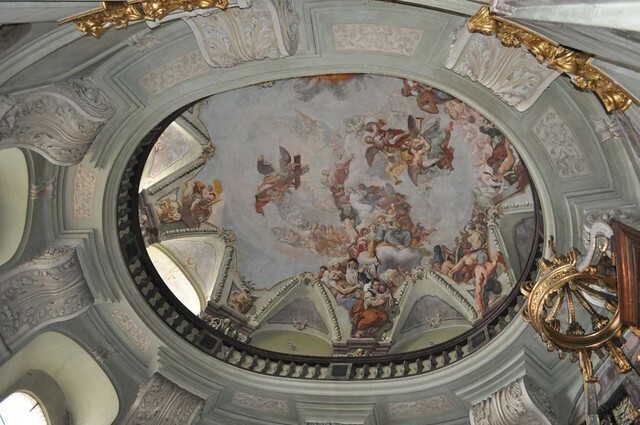 St. Nicholas Church in Little Town (Lesser Quatter, depends of translation of the Malá Strana) is the peak of baroque architecture in Prague and one of the best works north of the Alps. 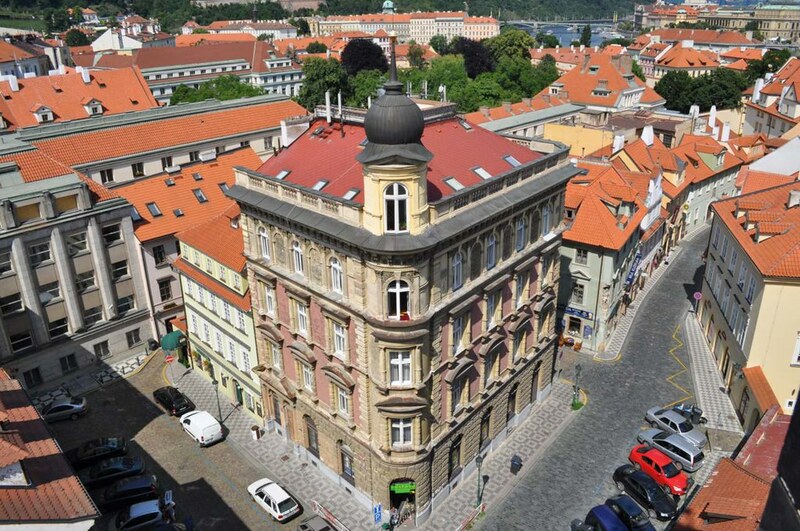 It was built in 1704-1755 by three generations of great Baroque architects – father, son and son-in-law: Kryštof Dientzenhofer, Kilián Ignác Dientzenhofer and Anselmo Lurago (remember Loreta from Prague Towers (1)). The bellfry, the next tower from our serie was finished by Anselmo Lurago, and contrary to the church the tower belongs to the city, therefore the entrance is not from the church but from the side street. 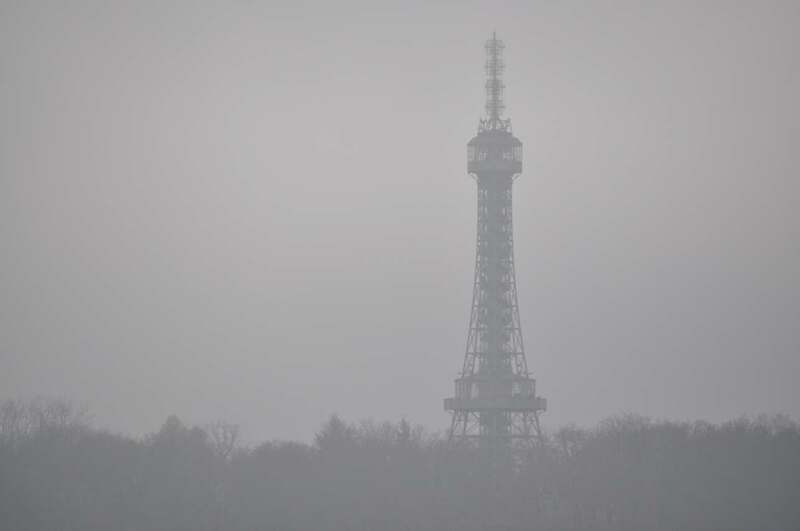 Originally the tower was planned to be low but then it was built high. 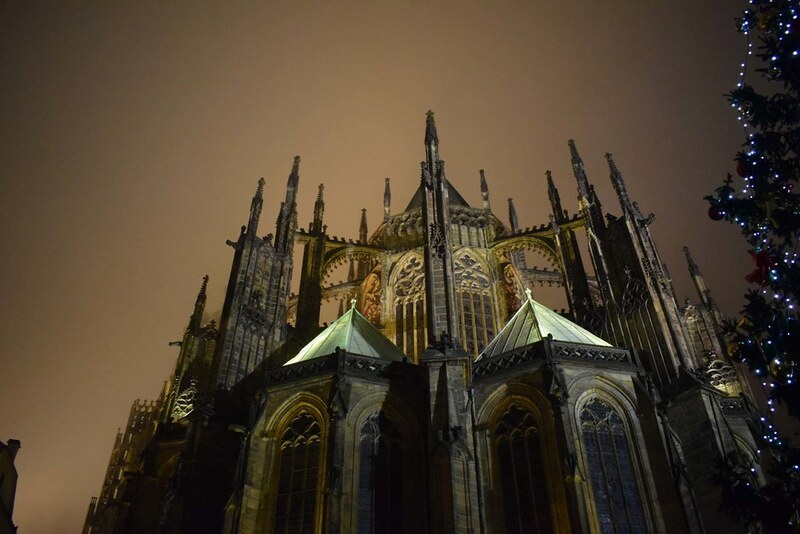 People were afraid it will fall down but time proved that it was built with perfect architectonic and engineer work. 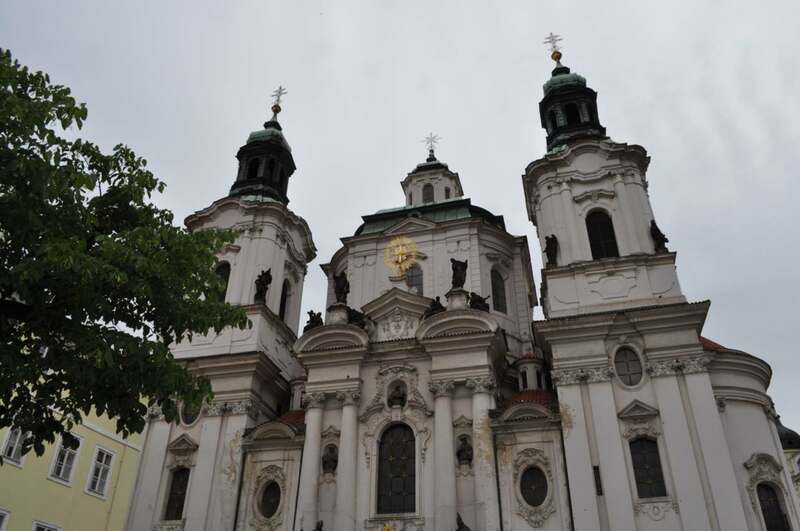 You can recognize it was built like a copy of the tower of St. Nicholas Church in the Old Town (you can find this one at Prague Towers (1)). During 18-19th centuries the guards served at the bellfry, their duty was to announce fires or enemies trying to enter the town. During communistic regime there was state police observatory and listening devices. 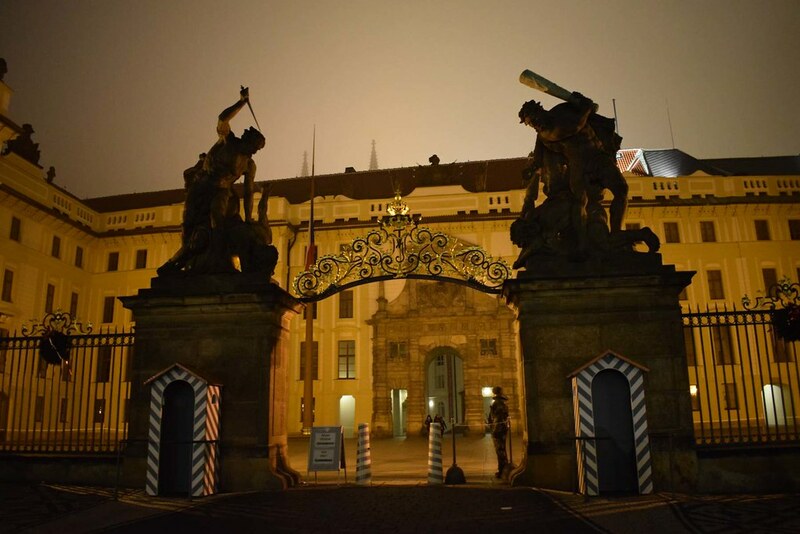 The reason was the proximity of American and Yugoslavian Embassies, and also path to Western Germany Embassy. 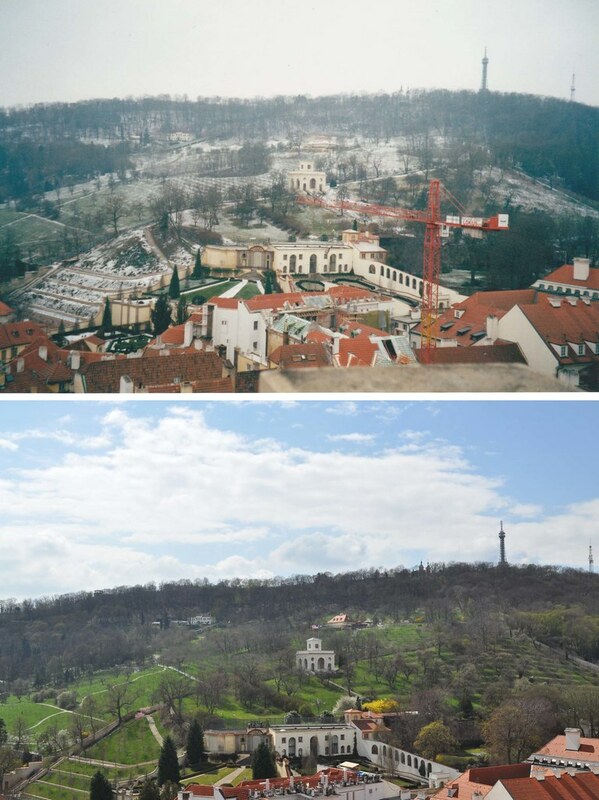 The last records from this observatory were done at the beginning of 1990 year (after revolution in November 1989). The exposition of former observatory called “Eider duck” picturing the work of State police was opened for public in April 2010. As most of the towers of my series, this tower can be climbed up. 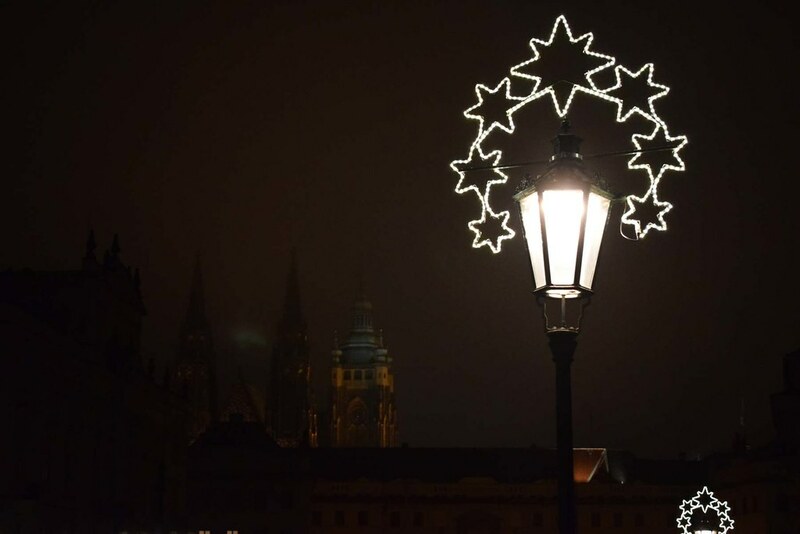 The flourish are played from the top of it every full hour during summer. 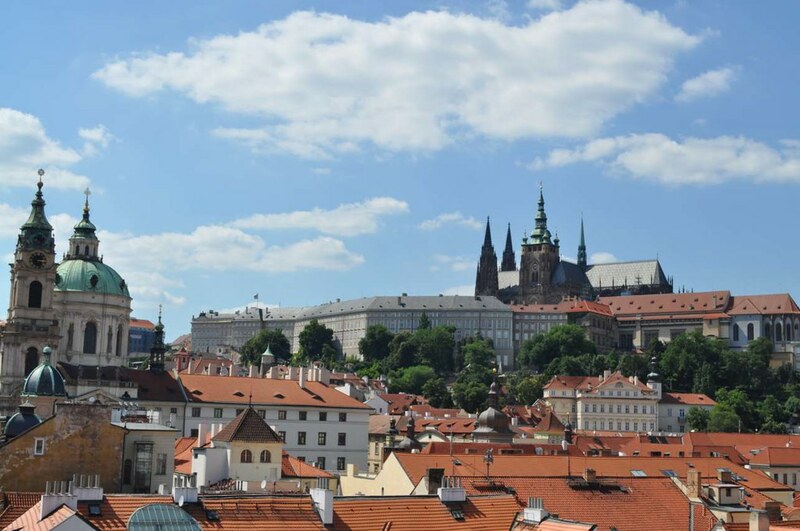 The bellfry tower is in roccoco style and it is 243 ft (74 m) high, the view is in 148 ft (45 m) and you have to climb 215 stairs to reach the view. 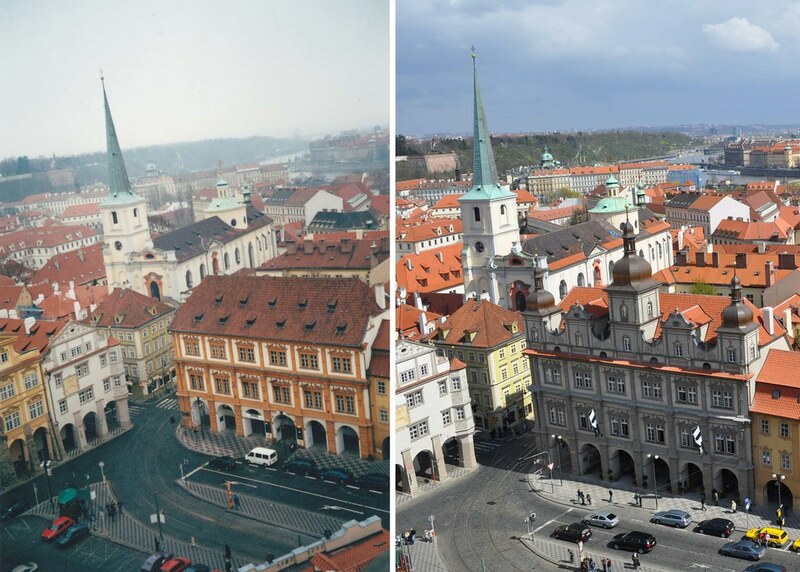 Little Town Square again – left 2003, right 2010, the bulding of Malostranská beseda before and after renovation to its original shape with spires. 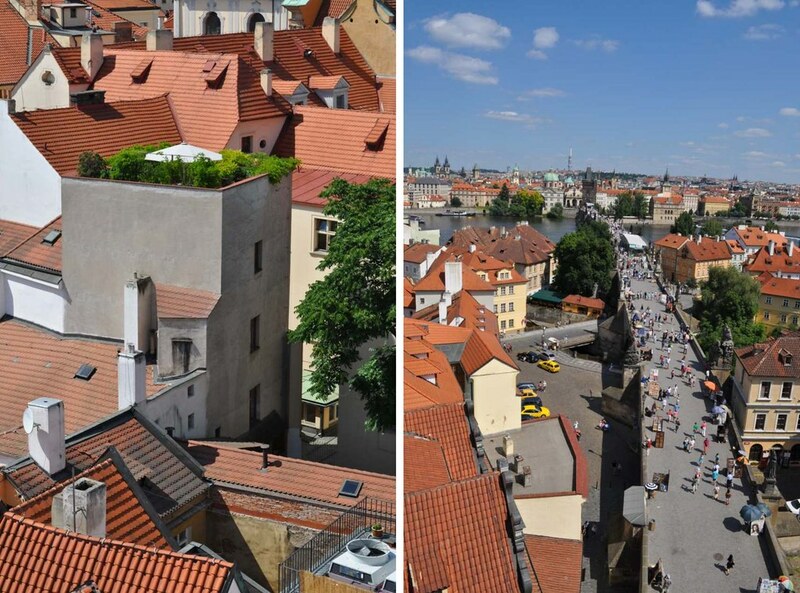 The next tower is Little Quarter’s Bridge Tower as seen from St. Nicholas Tower. 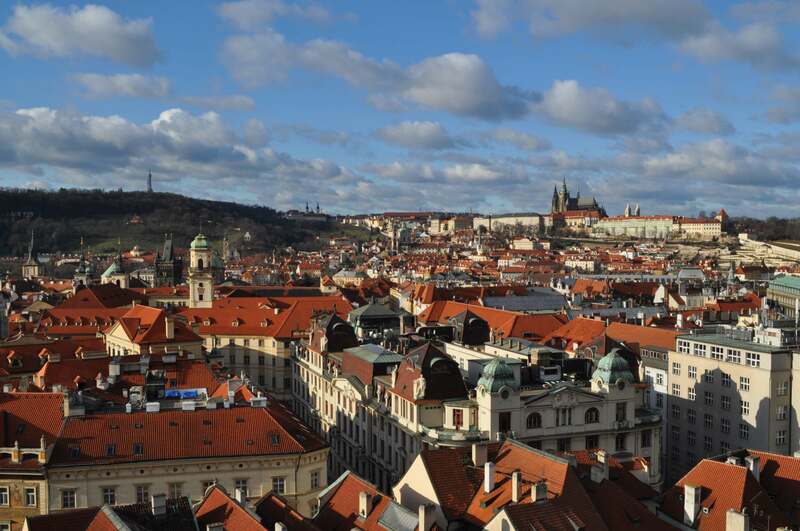 The introduction to Prague Towers series can be found here. 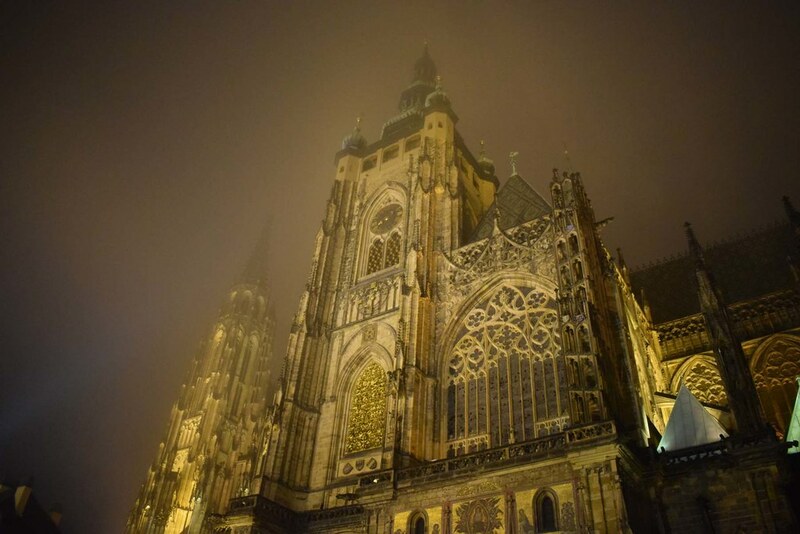 The first tower I chose for my Prague Towers series is the tower of St. Vitus cathedral in Prague Castle. 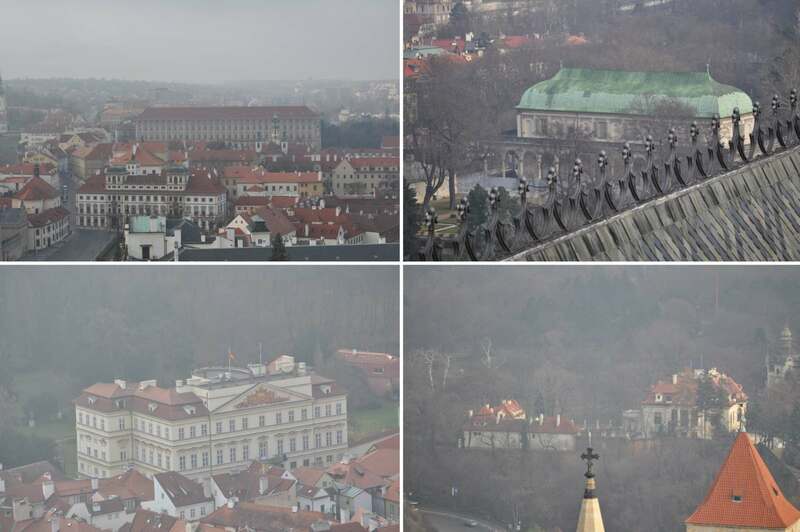 That’s the green one, which you will find on any panorama picture from Prague, also on my blog here or here or here and also at some other posts, I chose just the panoramatic ones. 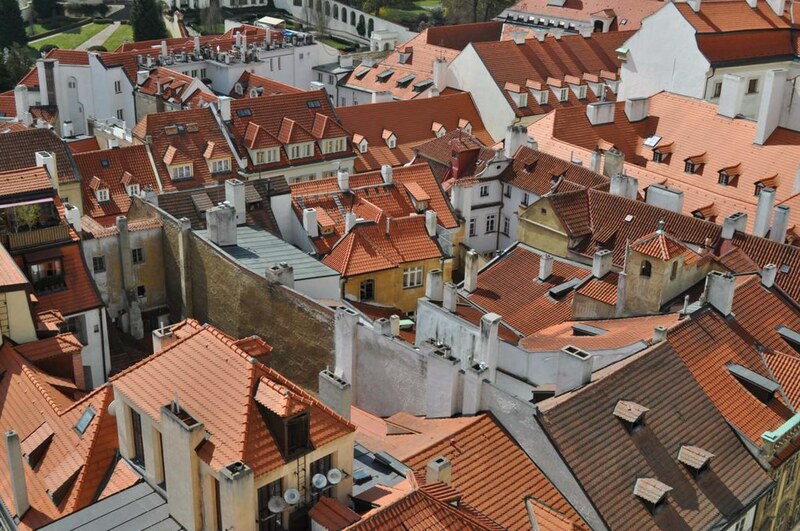 Today I start with a bit unusual view from the Prague Castle’s back, from Royal Summerhouse. 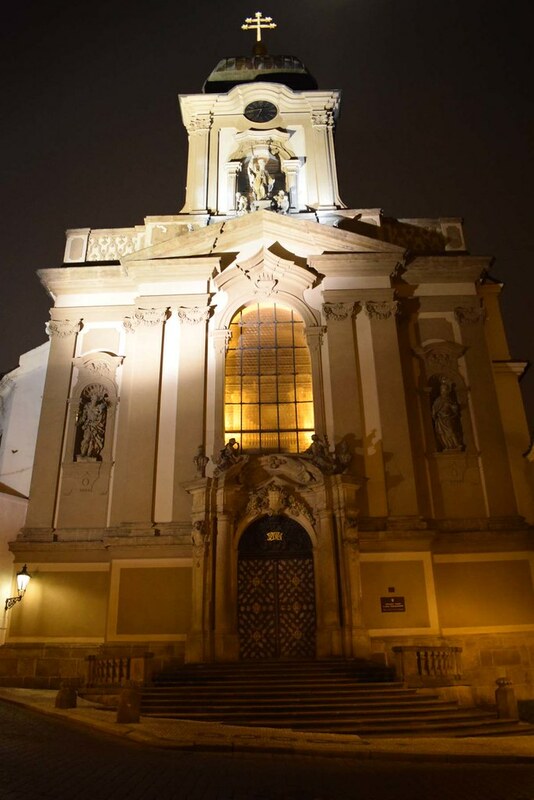 St. Vitus Cathderal was founded in 1344 by Czech king and Roman Emperor Charles IV as the most important church in Czech lands. 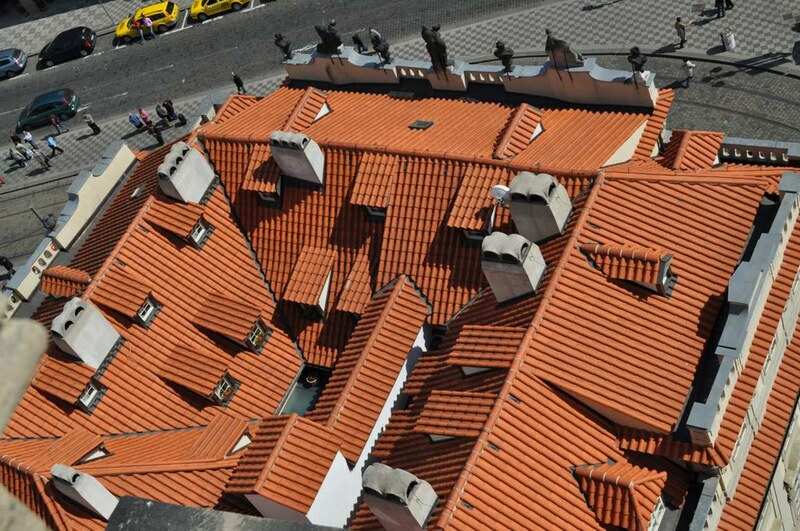 It was not built in the city center, as it is quite usual in Europe, but above it, in the complex of Prague Castle. It was built in four phases, finished in 1929. 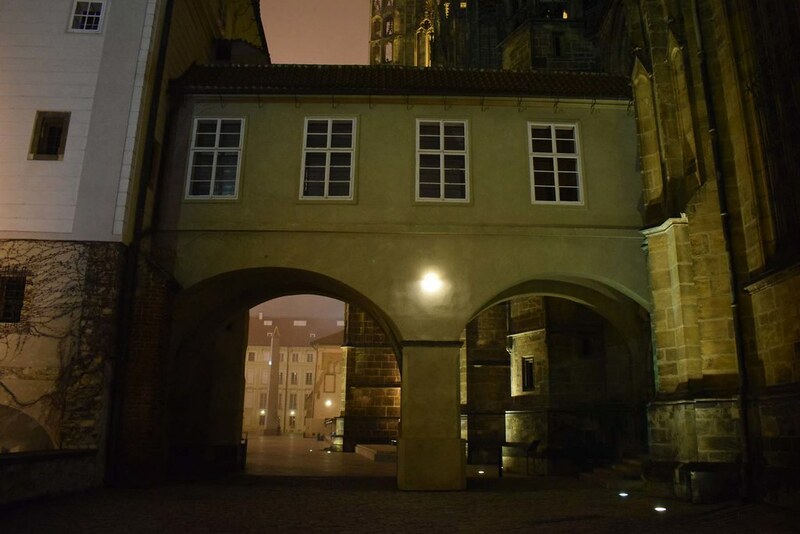 At the interior and the exterior you can see the traces of the centuries, but the building itself is gothic, despite the fact that the final works were done in puristic gothic style in 20th century. 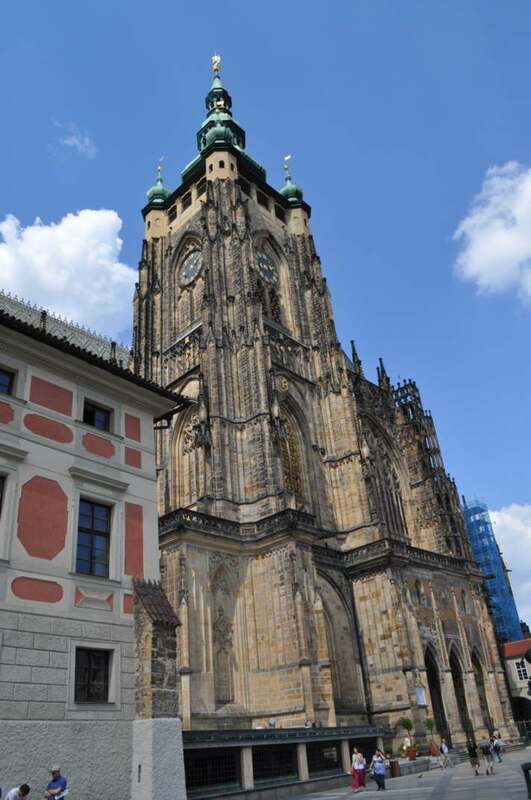 The tower we will talk about was founded in 14th century by Petr Parléř and it is called Bell Tower. The height of it was 180.5 ft (55 m). 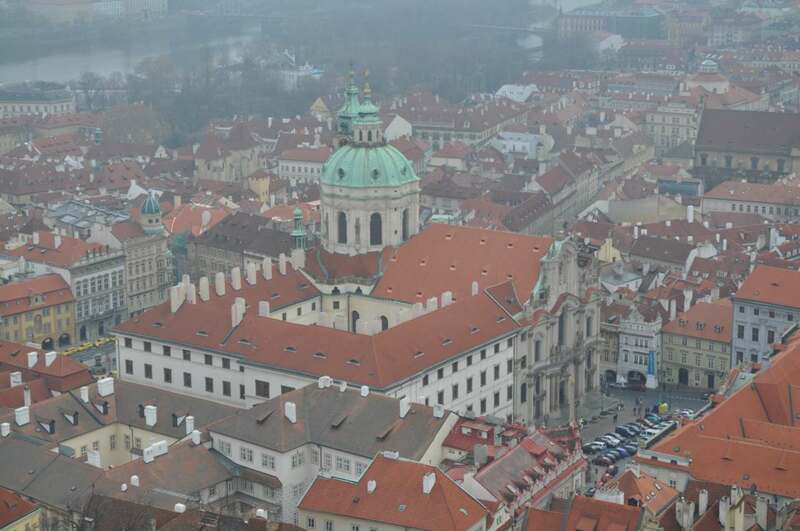 The tower partially burned during the big fire in 1541 and was rebuilt again in 1544. 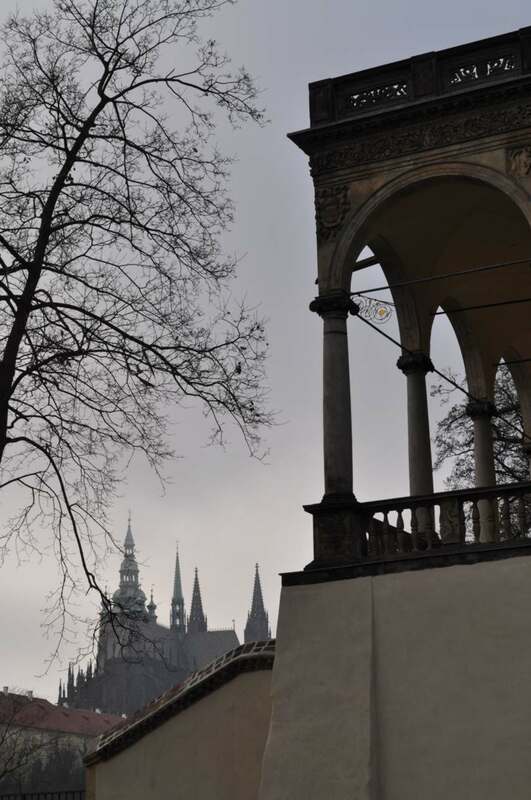 Therefore, Renaissance arcades were added with baroque green spire on the gothic bases. Zikmund (Sigismond) from 1549, the biggest Czech bell, done by Tomáš Jaroš, weight 13.5 tons and diameter 6.6 ft (2.56 m). You can listen to easter ringing of these bells from 2012 at this link. 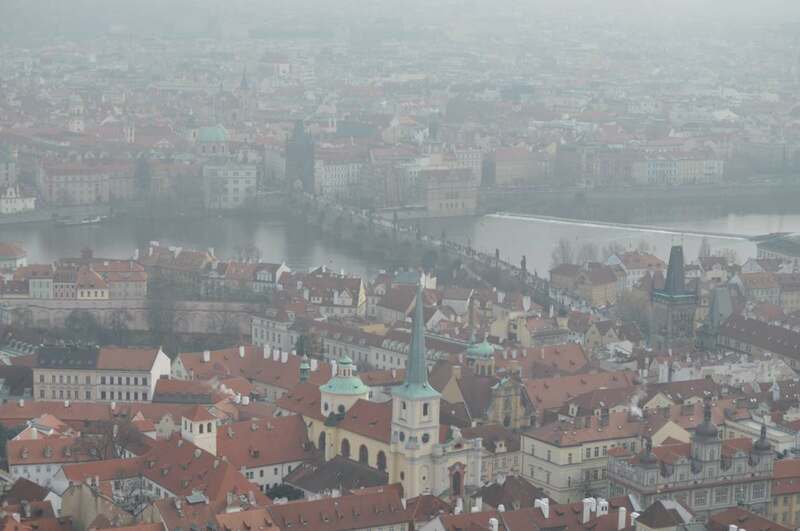 From St. Vitus bell tower there is one of the most beautiful views to Prague, even when the visibility is low. Looking straight down from the tower. And finally view to the city. 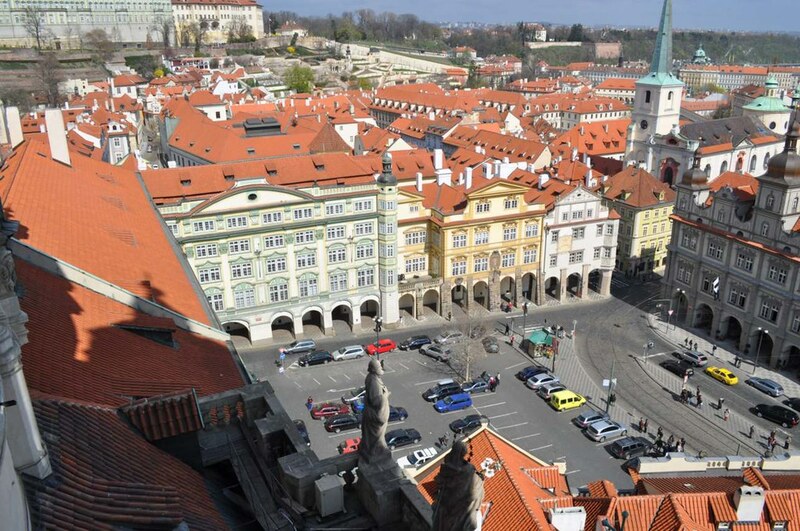 Our next tower will be Petřín Watchtower, how viewed from Bell Tower of St. Vitus Cathedral.